I am always on the hunt for a great holiday recipe. Nothing to fussy, but definitely something that stands out. 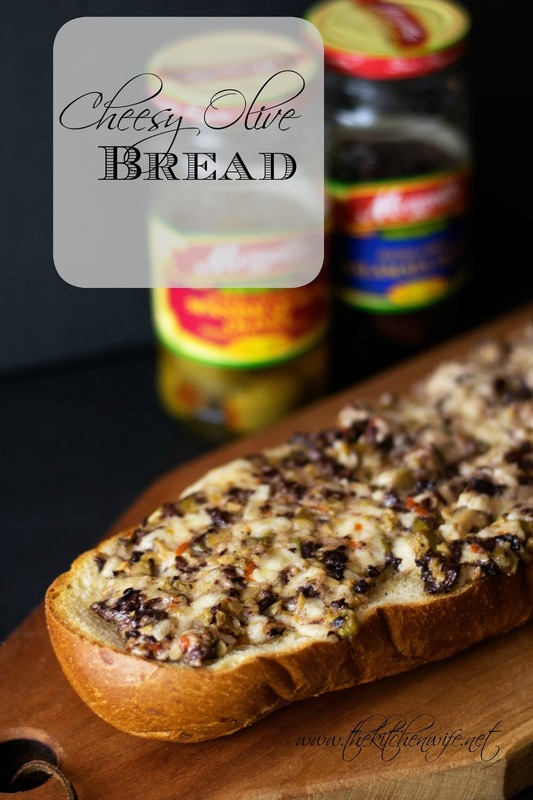 That is why I love this recipe for Cheesy Olive Bread. And the Mezzetta Kalamata Olives. I love using Mezzetta Olives because they have been family owned since 1935, and are committed to bringing their customers the highest quality foods available. Now you can place the chopped olives into a mixing bowl. Oh, and you may have noticed that I used an electric chopper to chop the olives up. If you don't have one don't worry. You can easily get the same fine chop with a chef's knife. Now you can add the sliced green onions to the mixing bowl with the olives as well. Using a rubber spatula mix everything together. Now it's time to get the bread ready. Using a bread knife, cut the loaf in half, lengthwise through the center. Lay each half on a baking sheet and place three large dollops in each half. 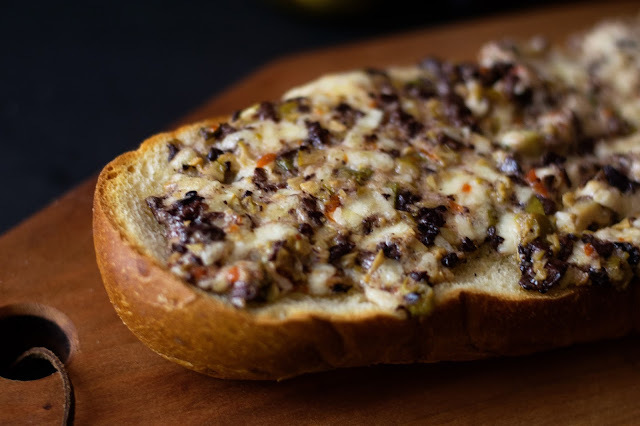 Using your rubber spatula spread the cheese mixture over the bread. Next place the baking sheet with the bread on it into the oven and bake for 25 minutes. And there you have it! Cheesy Olive Bread! It may have simple ingredients, but I promise you that when you serve this at your holiday get together EVERYONE will be asking for the recipe. And to make even more #MezzettaMemories head HERE for even more recipes and a fantastic holiday giveaway!!! In a mixing bowl combine the chopped olives, butter, mayonnaise, green onions, shredded cheese, and pepper. Mix it all together with a rubber spatula. Next cut the loaf of French bread in half and place three large dollops of the cheese spread on each side. Spread the cheese mixture all over the bread. Place into the preheated oven for 25 minutes. This looks so delicious, Mandee! We get all sorts of olives here in the UAE and they're pretty inexpensive too. I'm so excited to try this recipe. Thanks for sharing. Have a great week!